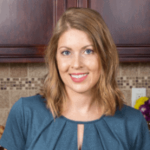 Published: Oct 30, 2017 · Modified: Apr 11, 2019 · By Jen Sobjack · This post may contain affiliate links. 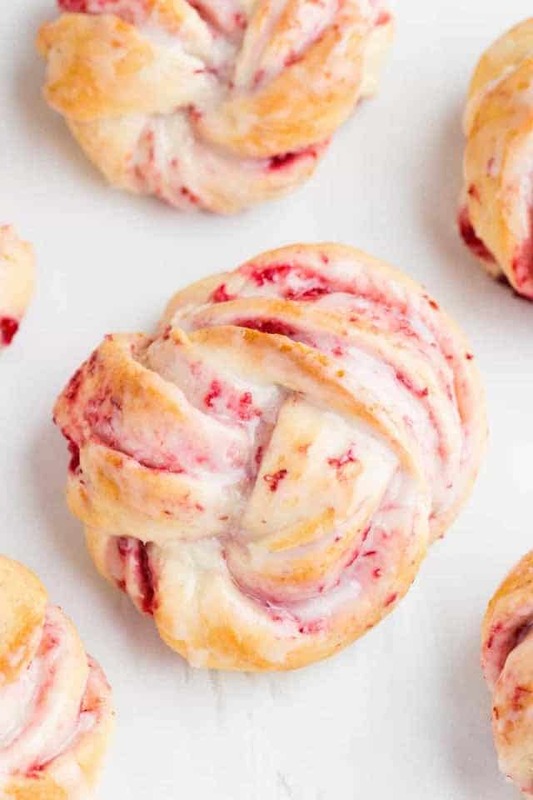 Cranberry Orange Sweet Rolls are the perfect holiday brunch or make-ahead breakfast. Each Soft, homemade roll is flavored with orange blossom water and filled with sweet cranberry filling. This post is sponsored by Nielsen-Massey. All thoughts and opinions are my own. There’s really nothing more satisfying than waking up to the smell of sweet rolls baking in the morning. Especially when they are filled with sweet citrus and cranberry. The holiday season is my favorite time for baking. Every year I whip up my favorite slow cooker orange sweet rolls but this year I’ve given them a makeover. This time they are baked in the oven and infused with orange blossom water. 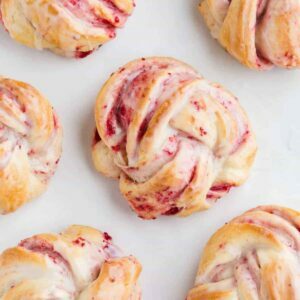 I also chose to fill them with homemade cranberry filling and shape them into knots instead of the traditional swirl. 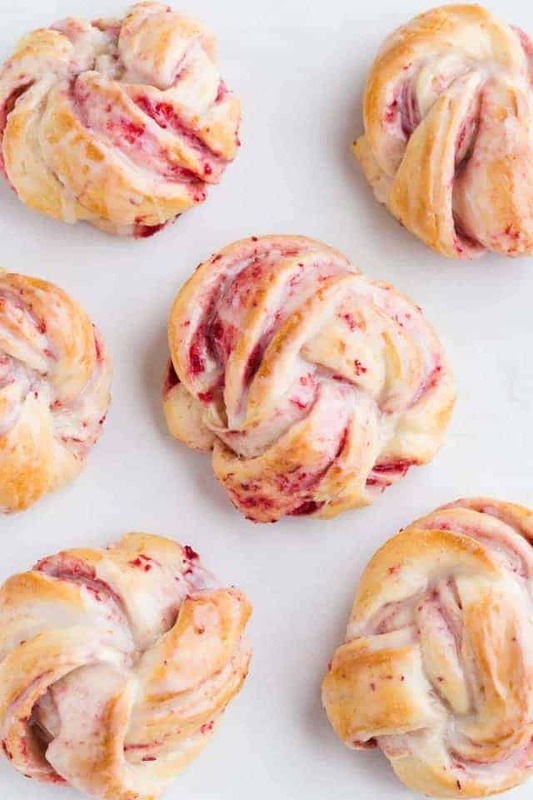 These cranberry orange rolls are guaranteed to be loved by all who try them. We all know working with yeast can be intimidating but I promise you can do this. Proof the yeast, mix it in with the other ingredients, and let the dough rise. It’s all too easy. 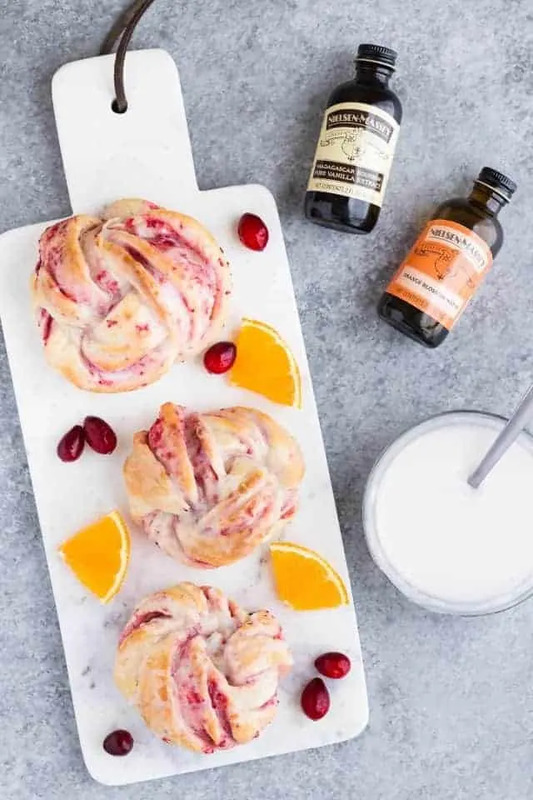 The flavor in these cranberry orange sweet rolls comes from Nielsen-Massey Orange Blossom Water and Pure Vanilla extract. They are both pure with rich, complex flavor profiles. 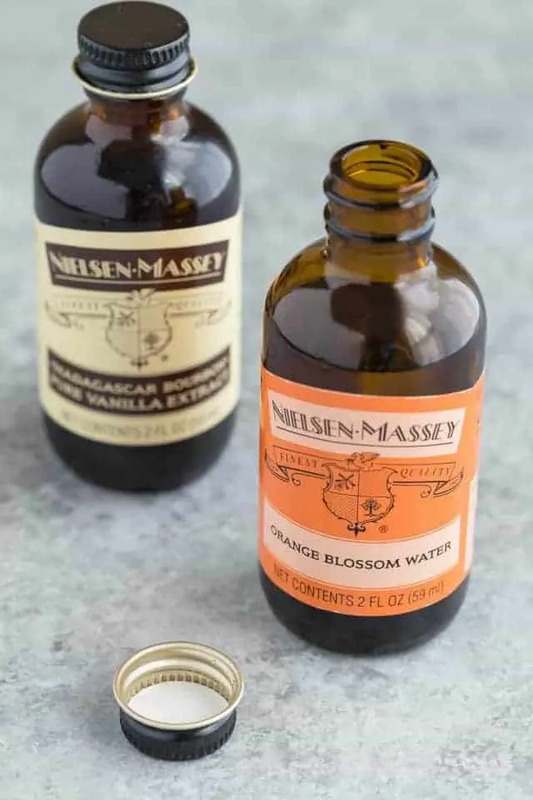 Nielsen-Massey Orange Blossom Water is produced by distillation of the blossoms from the bitter orange tree and it pairs wonderfully with vanilla. It has a light floral aroma which is noticeable in the sweet rolls. Nielsen-Massey Pure Vanilla Extract is the only vanilla I use. I buy the giant bottles of the Madagascar Bourbon Vanilla on Amazon because I use so much of it. It has a sweet, creamy flavor with velvety after-tones, making it a great all-purpose vanilla. The dough we’re using today is a basic sweet roll dough. It’s simple and easy to work with. It’s soft and rises beautifully. And it’s flavored with both vanilla extract and orange blossom water. There’s also a little orange zest speckled throughout. The dough comes together super easy if using a stand mixer. This has become the only way I make dough anymore because the mixer does all the work for you. Just turn it on and let it run until the dough is smooth and elastic. Once the dough is ready, it needs to rise in a warm place. I like to preheat my oven to the lowest temperature, then turn it off and place the dough inside with the door cracked slightly. It’ll take about an hour for the dough to double in size. The filling is made with cranberries, sugar, butter, and vanilla extract. You can use fresh or frozen cranberries for the filling. Cook the cranberries with sugar and a little water until they’ve softened and the juices have thickened. Transfer the filling to a food processor, add the butter and vanilla, and process until smooth. Refrigerate the filling until you’re ready to use it. It should keep for up to 1 week so you can make it well in advance if needed. Roll the dough out, slather the filling all over, and fold the dough over like you’re folding a letter. Slice it into 1-inch strips. Twist each strip and tie it into a knot. Then let the cranberry rolls rise one more time until they are doubled in size. You can prep the rolls at night and bake them the following morning. This makes them perfect for feeding a hungry crowd breakfast during the holidays. The rolls will bake up into a lovely golden brown with swirls of red cranberry filling showing. Glaze them with a simple mix of powdered sugar, orange blossom water, and milk while they are hot from the oven. You can’t go wrong when using Nielsen-Massey products. They are all-natural, certified gluten-free, certified Kosher, allergen-free, and GMO-free. No matter what your needs are, they’ve got you covered. For more inspiration using Nielsen-Massey vanillas and flavors, visit their website nielsenmassey.com and follow them on Facebook, Twitter, and Instagram. 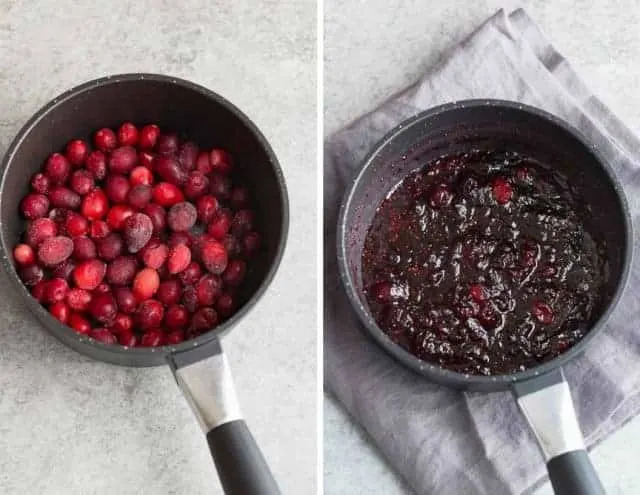 Combine cranberries, sugar, and water to cover by 1 inch in a small saucepan. Bring to a boil over high heat. Reduced the heat to low and cook until cranberries are soft and juices have thickened, about 15 minutes. Remove from heat and carefully transfer to a food processor. Add the butter and vanilla. Process until smooth. Cool completely and refrigerate in an airtight container for up to 1 week. In a small bowl, combine 3/4 cup of the warm milk, yeast, and 1 tablespoon of the sugar. Let stand for 5 minutes, until foamy. In the bowl of a stand mixer fitted with the paddle attachment, stir together the remaining sugar, butter, yogurt, egg, vanilla extract, orange blossom water, orange zest, salt, and remaining warm milk. Stir half the flour into the sugar mixture. Add the yeast and mix on low speed just until combined. Switch to the dough hook attachment and gradually beat in reaming flour, one cup at a time. Beat on medium speed until the dough is smooth and elastic, about 5 minutes. Sprinkle in a little more flour if needed (the dough should not be sticky). Lightly grease a large bowl with olive oil or cooking spray. Place the dough in the bowl and turn it to coat in oil. Cover loosely and let rise in a warm place until doubled in size, about 1 hour. Gently punch down the dough and let rest for 5 minutes. Turn the dough out onto a light floured surface and roll into a 21×13-inch rectangle. Spread the cranberry filling over the dough. Fold in thirds, like folding a letter, to create a 13×7-inch rectangle. Cut the dough into 12 equal strips. Twist each strip and tie it in a knot, tucking the ends under. Place on prepared baking sheets. Cover and let rise in a warm place until doubled in size, about 30 minutes. Preheat the oven to 350°F. Bake the rolls, one batch at a time, until light golden brown, 15-20 minutes. Drizzle with glaze while rolls are hot. Let cool for 10 minutes. Serve warm. Rolls will keep for up to 3 days stored in an airtight container at room temperature. Combine the confectioners’ sugar and orange blossom water in a small bowl. Stir in just enough milk to create a smooth pourable glaze. The rolls can be prepared the night before serving. Prepare through step 8, cover tightly, and refrigerate for 8-12 hours. The following morning, set rolls on the counter for 2 hours before continuing with step 9. Freeze baked rolls for up to 3 months. Thaw in the refrigerator overnight and warm to your liking before serving.